It has taken ten years of designing gardens to meet my toughest, trickiest and most demanding client. As a general rule, I have been very fortunate in the clients I have dealt with over the years. To the point some have become friends and I even have first dibs on two houses I have designed gardens for if they ever go up for sale. I have a few clients that randomly send me photos of their garden on particular days that they look out and think it looks extra special and feel the need to share it back with me. Never ceases to land a smile on my face. It has only been recently that I have stumbled across this particular client that is causing me issues in my life. It probably isn’t the best business practice to publicly talk about this client except for the fact the client is ME! I have lived in my house for almost 3 years and to be honest the back garden hasn’t bothered me. However the public criticism and humiliation of people saying “I thought you were a garden designer” or the tongue in cheek remark “I love what you have done here”. I never wanted to be the horticultural equivalent of the mechanic who’s car doesn’t run. It is time something was done to get these people off my back, maybe actually show some of them a sneak peak at what I actually do. It is an interesting concept to sit there and finally decide to do your garden. In theory this should be very easy for me. It is what I do for a living. Every day I go to work and meticulously plan how peoples gardens are going to be put together. While doing this for a living I have one very simple luxury and that is, I do not have to foot the bill for the great ideas we come up with that end up going into these gardens. Part of my job as a designer is to educate people about correct horticultural and landscaping practises. Some of this education comes down to helping people understand what different elements cost to install and why things can cost what they have been quoted. Even with a good grounding on what things cost and what goes into constructing them, when it is your own money, seeing the bottom line on some quotes can make your heart skip a beat. I have started this process by listening to some simple advice I give clients. “Know where the finish line of the project is before you start the project”. Taking this piece of advice, I actually designed a concept and thought about the garden before I went hell for leather pulling things out and randomly building new elements into the garden. During the design process I remained very reserved. I don’t want the garden to be overwhelming, I mean I would love to go crazy but it just isn’t the garden for that sort of design. I don’t see myself living in this house for a long period of time. I think it needs to be the sort of garden that makes an impact on people as they walk in the kitchen/living area but doesn’t over capitalise on the house itself. Plus whatever I design I am going to have to build and my skills or what used to be skills are rather rusty, or left me years ago, about the same time as my youthful exuberance for this sort of thing. I thought I would be clever so I asked my landscape contractor for a favour and got him to price the concept plan for me. The quote came back at 35K. This is me being reserved! In all honesty, the size of the garden and what I want to achieve from it the quote came in at about exactly what I thought it was going to be. Now the tough part, planning and project managing how this thing actually gets built. Given the fact I generally work 6 days most weeks it doesn’t really fill me with excitement to want to be out in the garden constructing it on my one day off a week. I’d much rather be at the beach or investigating an established garden somewhere. The client in me is saying “this whole project is happening too slowly”. The landscaper in me is saying “we are going as fast as we can”. The lazy in me is saying “pay someone to build this for you”. My bank manger is saying “you’re doing all of this yourself”. 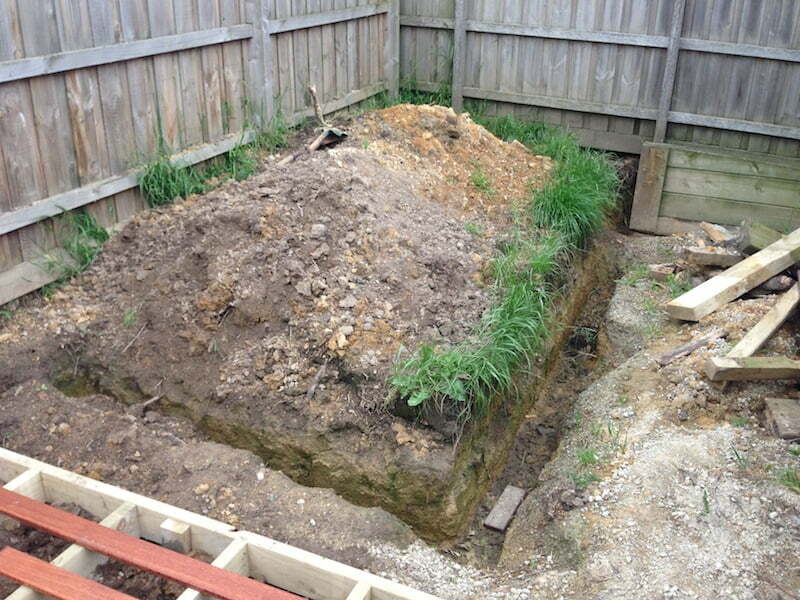 Currently I am about half way through the excavation of the job. 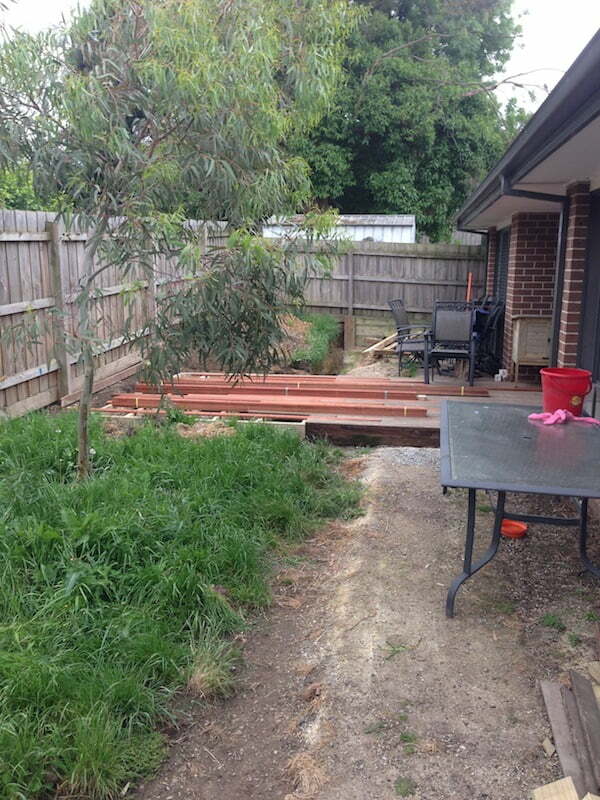 I am trying to keep half of the back yard usable for a dog rather than have a big bomb site. Footings are almost dug for retaining walls ready to be poured. I now know what it is like to be a client. I have been putting money into this project in rubbish removal etc. so far and there seems to be zero return for the dollars. I hope once I see the footings go in and the walls come up out of the ground I will be flushed with motivation to finish the project. And let’s be honest all I want to do is get to the fun part which is planting and experimenting and seeing what I can get to blend together. I could have just done a little planting make over, maybe thrown a bit of paving down. I have chosen to do this properly in the hope that one day I can throw the doors open to the public and say come and have a look at my own space and the sort of plants I play with and enjoy. At the moment it has been a hard push to get motivated to do anything and this part is the hard slog. The garden always gets worse before it gets better. The one thing I do intend to do is stick to what has been put on paper for the end result of this garden. This way there is no compromise to cutting corners or not quite finishing things. Our gardens are meticulously planned to be completed as efficiently as possible so there is no reason why this one should be any different. When it is finished I will let you all know and you can come over for a look. Its easy to have rules of how you run your designs professionally but hard to impliment them to yourself. I did have the “Client” experience the other night to come home and find the decking completed. I was like a kid in a candy store. Then had the realisation that this is how our clients feel. “The garden always gets worse before it gets better”. So you’re saying there’s a promise that it eventually will?! I find as a (once-was) designer that it’s paralysis of choice that does me in. Paralysis of choice – I’ve been stricken with that for the last two years in my own garden. I’m in the middle of a large-scale garden reno at the moment, and the way I’m dealing with choice overload is to employ a ‘just get it done’ mentality – to great effect! I happily undertake plant choice at a snail’s place, though. I think I just enjoy leafing through all the colourful nursery catalogues. I do Promise it will get better! Especially after the decking was complete and I got that excited feeling. I am now very excited to get it to a point where I can start to play with plant combinations. Starting a whole makeover would be beyond me, so am very admiring of your talent and dexterity, Brent. When it comes to house and garden, I have always worked around, through and over what’s there already. Interestingly , after 25 years here, I find I’m returning some of the plant varieties that were in place then, to their original position – and which I has subsequently ripped out. The creator of this garden knew what they were doing, I have come to realise …so perhaps restoration is the word I should be using. I love doing garden resto’s!! Mainly because I love (and get picked on for) my “Nana Plants”. There are so many plants that worked so well before we started hybridising everything. Dont get me wrong some of the new hybrids are fantastic however I just love going old school and seeing peoples faces and hearing the stories of the memories that come flooding back when I show people photos of the plants we are going to use. Hi Brent, This all rings true for me. Years ago I happily took on lots of designs and with the freshness of youth, no worries. Now just as you have encountered, dealing with your own space can be a massive challenge. I want to do up an old paddock and redesign an entrance area. Bull dozer is booked (the easy bit) but I can’t get my head around planting, making it interesting and not spotty. Oh for the energy and idealism of the early days. Sounds like a great project. I have a dream that I will get to do that in the coming years. Country property, house, dam and then the garden as my playgroud. Ahhh Brent, I can sympathise with you!!! The joys of doing your own garden as a designer!! With the endless lists of “I love this plant”, “I really want this plant”, “I would love to include this element/material/feature/screening” and the reality of fitting it all into the available space and feeling satisfied with the decisions you’ve made is a journey of ups ad downs!! Particularly because you know people will be viewing your garden with a little more interest because you’re a designer! But I wouldn’t swap it for anything …. I have absolutely loved creating my garden, first razing it all to the ground and getting rid of every weedy plant (that in itself is very rewarding) and then gradually creating my sanctuary filled with the plants and elements that I like and want. It is well worth it, especially when you get to sit amongst what you’ve created and see it grow into the intended design. Oh, the serenity! All the best with your journey and I really look forward to hearing how it progresses. Thanks for sharing! So Brent, how is the ‘worst client of all’s” garden going? Any progress? Have you been able to stick to what was put on paper? When can we all come over for a look? Still a Work In Progress. We keep doing silly things like taking on 3 gardens at MIFGS and client work that actually allow me to stay in the house for another month. I cant complain. we are very fortunate to be doing something we love and getting paid some money to do it. We did also add the arch nemesis of new gardens to the already complicated procedure. almost 12 months ago we got a pup. Who we discovered also loves gardening. Her technical practices need some work. I came home one evening to find a Viburnum i had planted on the weekend planted on the middle of the garage floor. Lucky she is bloody adorable. The slabs for the paving have been down for quite a while now. I have had paving put aside for it 3 times and then it gets used. I have found 4 types of stone I want to go on the walls. Then I find another one. I did put the trees in which are nice and growing. Slowly, slowly… but we’ll get there. And a puppy? … yes, it may be a cute, fun and adorable companion, BUT really! Haha. All wonderful life things to be doing when the reality is the garden will always be there to tinker with when time permits. And yes, I’m always up for a visit. All the best for MIFGS this year. I can’t wait to see you work your magic again. Keep sane in the lead up and construction though! See you there. 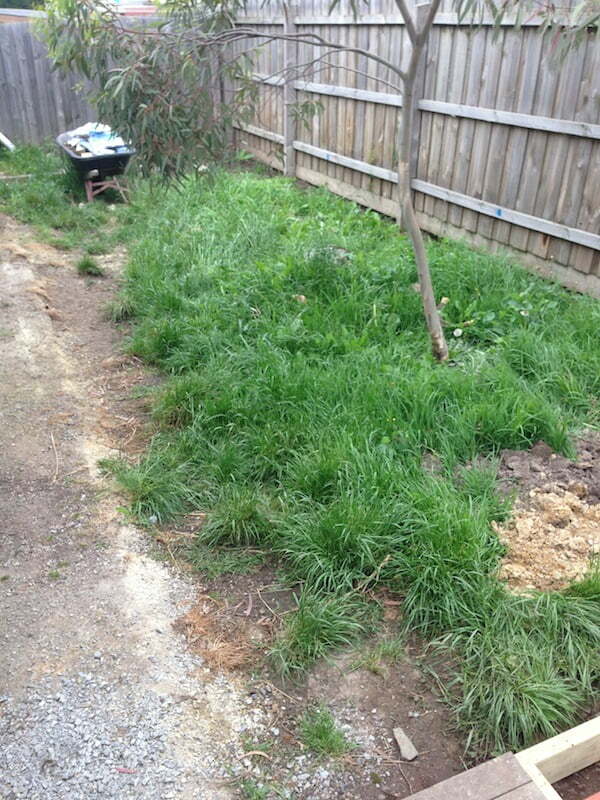 You just commentated my current prediciment as a landscape designer and my own back yard!! With fresh eyes I can see what needs to be done in any clients garden. But in backyard, I have stared it for so long I doubt I can see it anymore. So far I have sprayed lines on the ground of where things might go and then, without a client brief, I come up with a whole new idea! This may take a long time!! Draw it!… Set your own brief. I actually havent strayed too far away from my design. My part at the moment is actually getting the time to do it. And a puppy that thinks plants should be planted on the decking or in the garage. Maybe i’ll get some more time in winter? We are crazy beasts us design folk. IT’s okay. I’m a seamstress. I own one summer dress. The last thing you want to do at the end of your day is more of the same. And, I have so much more trouble knowing what I want than helping other people to know what they want. 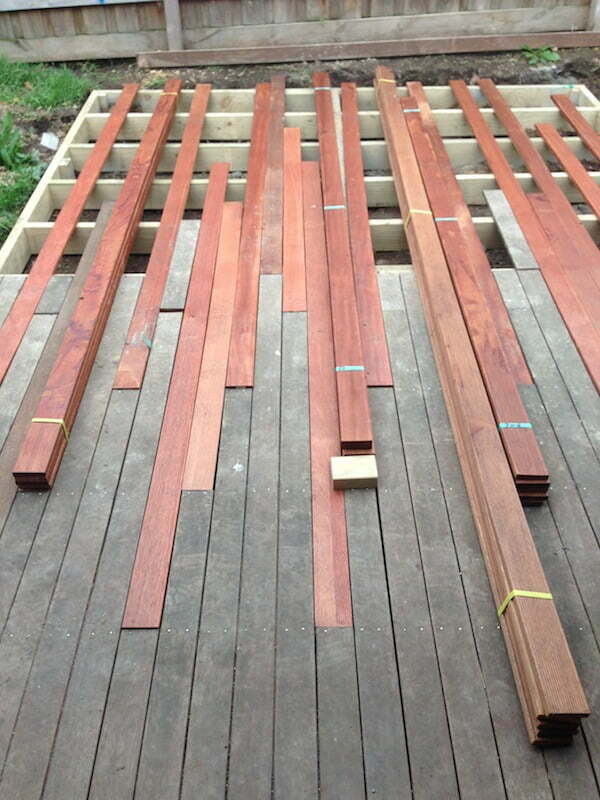 The decking idea, bloody brilliant. So simple but very clever. Good luck. Its the old case of a mechanics car never runs. Builders house is never finished and a seamstress only has 1 summer dress. Hopefully I will write a post sometime later this year and show everyone a completed garden. Then I might even open it at some stage.